An upper respiratory infection is any infection – viral or bacterial – that affects the nasal cavity and sinuses, the throat (or pharanx) and the larnyx (voice box.) An upper respiratory infection can be as simple as a common cold or as serious as strep throat. How serious is an upper respiratory infection? Upper respiratory infections (URI) are one of the most frequent causes of doctors visits with symptoms ranging from laryngitis to sinus infections. In the United States, upper respiratory infections are the most common illness leading to missing school or work. 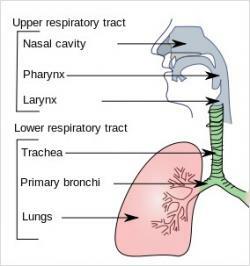 With so many different types, an upper respiratory’s severity is dependent on the infection that you have. For example, virus like a cold is treated much differently than a bacterial infection, like strep throat. How do I tell if its an upper respiratory infection? Can I treat an upper respiratory infection at home? When the symptoms are virus related, such a cold or laryngitis, you can use over the counter medications such as decongestants, pain relievers, throat and nasal sprays to reduce symptoms while the upper respiratory infection runs its course. However, when the infection is bacterial, such as sinusitis or strep, medical intervention will be involved. will most likely be required. Do I need an appointment at FastMed? No appointment is necessary- we’re open 365 days a year and walk-ins are always welcome. Our team of medical professionals will diagnose your condition and prescribe the appropriate course of treatment. Staff can even provide you with onsite medications, so you leave our clinic with your medications in-hand. Bacterial infections can be highly contagious - find the FastMed Urgent Care nearest you and let’s us help get you feeling better.